Panama, officially the Republic of Panama (Spanish: República de Panamá, IPA [re'puβlika ðe pana'ma]), is the southernmost and most developed country of Central America. A transcontinental country, its isthmus constitutes the southernmost part of a natural land bridge between the continents of North America and South America. It borders Costa Rica to the northwest, Colombia to the southeast, the Atlantic Ocean to the north and the Pacific Ocean to the south. There are various stories about the etymology of Panama's name. Some say that it comes from an unspecified indigenous language from words meaning variously "an abundance of fish" or "an abundance of butterflies." Another humorous tale states that the name comes from the indigenous kuna word bannaba, meaning "farther that way," which is what the Kunas told explorers looking for gold. Much of Panama's domestic politics and international diplomacy in the 20th century was tied to the Panama Canal and the foreign policy of the United States. At the turn of the 20th century, Theodore Roosevelt pursued United States diplomatic efforts to facilitate a deal with Colombia that would allow it to take over French canal operations started by Ferdinand de Lesseps. In November 1903 the United States supported a covert Separatist Junta consisting of a small number of wealthy Panamanian landowners and led by Dr. Manuel Amador Guerrero to secede from Colombia. On 3 November, 1903, Panama declared its independence from Colombia. The President of the Municipal Council, Demetrio H. Brid, highest authority at the time, became its de facto President, appointing on November 4 a Provisional Government to run the affairs of the new republic. The United States, as the first country to recognize the new Republic of Panama, sent troops to protect its economic interests. The 1904 Constituent Assembly elected Dr. Manuel Amador Guerrero, a prominent member of the Conservative political party, as the first constitutional President of the Republic of Panama. In December 1903 representatives of the republic signed the Hay-Bunau Varilla Treaty which granted rights to the United States to build and administer indefinitely the Panama Canal, which was opened in 1914. This treaty became a contentious diplomatic issue between the two countries, reaching a boiling point on 9 January 1964: Martyr's Day. These issues were resolved with the signing of the Torrijos-Carter Treaties in 1977. The original intent of the founding fathers was to bring harmony between the two major political parties (Conservatives and Liberals). The Panamanian government went through periods of political instability and corruption, however, and at various times in its history, the mandate of an elected president terminated prematurely. In 1968, a coup toppled the government of the recently elected Arnulfo Arias Madrid. Gen. Omar Torrijos eventually became the leading power in the governing military junta, and later became an autocratic strong man until his death in an apparent airplane accident in 1981. After Torrijos's death, power was eventually concentrated in the hands of Gen. Manuel Noriega, a former head of Panama's secret police. Noriega was implicated in drug trafficking by the United States, resulting in difficult relations by the end of the 1980’s. To remove Gen. Manuel Noriega, on December 20, 1989, the United States invaded Panama in a large military operation involving 25,000 United States troops (see US invasion of Panama). Allegedly, the death of an unarmed U.S. soldier in plain clothes in Panama at a Panamanian Defence Forces roadblock was one of the precipitating causes for the invasion along with drug trafficking charges and Noriega's refusal to hand over power after being defeated in elections. 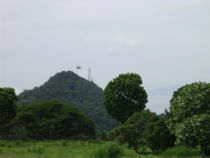 However, according to the Panamanian government at the time, the officer's vehicle attempted to drive through the roadblock, which was located near a sensitive military location. A few hours after the invasion, in a ceremony that took place inside a U.S. military base in the former Panama Canal Zone, Guillermo Endara, the winning candidate in the May 1989 elections, was sworn in as the new president of Panama. The invasion occurred 10 years before the Panama Canal administration was to be turned over to Panamanian control, according to the timetable set up by the Torrijos-Carter Treaties. After the invasion, Noriega sought asylum in the Vatican diplomatic mission represented by Monsignor Jose S. Laboa. To induce Noriega's surrender, US forces played loud music outside the embassy. After a few days, Noriega surrendered to the American military, and was taken to Florida to be formally arrested and charged by U.S. federal authorities. He will be eligible for parole in 2007. Under the Torrijos-Carter Treaties, the United States returned all canal-related lands to Panama on December 31, 1999, but reserves the right to military intervention in the interest of its national security. Panama also gained control of canal-related buildings and infrastructure as well as full administration of the canal. Politics of Panama takes place in a framework of a presidential representative democratic republic, whereby the President of Panama is both head of state and head of government, and of a pluriform multi-party system. Executive power is exercised by the government. Legislative power is vested in both the government and the National Assembly. The Judiciary is independent of the executive and the legislature. Panama is located in Central America, bordering both the Caribbean Sea and the North Pacific Ocean, between Colombia and Costa Rica. Its location on the eastern end of the isthmus forming a landbridge connecting Central and South America is strategic. By 1999, Panama controlled the Panama Canal that links the North Atlantic Ocean via the Caribbean Sea with the North Pacific Ocean. A nearly impenetrable jungle forms the Darien Gap between Panama and Colombia. It creates a break in the Pan-American Highway, which otherwise forms a complete road from Alaska to Chile. Panama's economy is service-based, heavily weighted toward banking, commerce, and tourism, due to its key geographic location. The handover of the canal and military installations by the US has given rise to new construction projects. The Martín Torrijos administration has undertaken controversial structural reforms, such as a fiscal reform and a very difficult Social Security Reform. Furthermore, a Referendum regarding the building of a third set of locks for the Panama Canal was approved overwhelmingly (though with low voter turnout) on 22 October 2006. The official estimate of the building of the third set of locks is US$5.25 Billion. The Panamanian currency is the balboa, fixed at parity with the United States dollar. No other country had export and import levels as high as Panama. Its exports of 64 percent of GDP were much higher than the number two in that category, the Dominican Republic (48 percent), while its imports of 61 percent were much higher than Honduras at 51 percent. 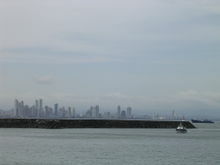 The high levels of Panamanian trade are in large part due to the Colon Free Trade Zone, the largest free trade zone in the Western Hemisphere. Last year the zone accounted for 92 percent of Panama's exports and 65 percent of its imports, according to an analysis of figures from the Colon zone management and estimates of Panama's trade by the United Nations Economic Commission for Latin America and the Caribbean (ECLAC). Panama also did well in tourism receipts and foreign direct investment as a percent of GDP (the fourth-highest in Latin America in both categories) and Internet penetration (eight-highest rate in Latin America). Panama, long a bastion of low inflation, will get the honour of having the region's lowest inflation in 2007, according to the IMF. The rate is predicted at 2.3 percent, compared to 2.8 percent estimated for 2006. Panama City has has seen a race between two rival projects aimed at becoming the tallest building in Latin America. The 104-story residential and hotel building, Ice Tower, is slated to be completed in 2010. Spain-based Olloqui Group is constructing a 93-floor building, Palacio de la Bahía, located on the Bay of Panama. It is expected to be finished in 2009. The two projects were originally smaller, but subsequently started adding floors to obtain status at the tallest building in the region. The real estate boom isn't limited to Panama City, as there are also developments in different parts of the country. The culture, customs, and language of the Panamanians are predominantly Caribbean Spanish. Ethnically, the majority of the population is mestizo or mixed Spanish, Chinese , Amerindian, and African descent. Spanish is the official and dominant language; English is a common second language spoken by the West Indians and by many in business and professional fields. More than half the population lives in the Panama City– Colón metropolitan corridor. The overwhelming majority of Panamanians are Roman Catholic, accounting for almost 80% of the population. 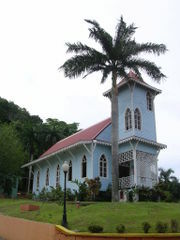 Although the Constitution recognises Catholicism as the religion of the great majority, Panama has no official religion. Minority religions in Panama include Protestantism (12%), Islam (4.4%), the Bahá'í Faith (1.2%), Buddhism (at least 1%), Judaism (0.4%), and Hinduism (0.3%). The Jewish community in Panama, with over 10,000 members, is by far the biggest in the region (including Central America, Colombia and the Caribbean). Jewish immigration began in the late 19th Century, and at present there are three synagogues in Panama City, as well as three Jewish schools. Within Latin America, Panama has one of the largest Jewish communities in proportion to its population, surpassed by Uruguay and Argentina. Panama's communities of Muslims, East Asians, and South Asians, are also among the largest. Panama City hosts one of only seven Bahá'í Houses of Worship in the world. Completed in 1972, it is perched on a high cliff overlooking the canal, and is constructed of local stone laid in a pattern reminiscent of Native American fabric designs. The country is also the smallest in Spanish-speaking Latin America in terms of population, with Uruguay as the second smallest (by almost 400,000). However, since Panama has a higher birth rate, it is likely that in the coming years its population will surpass Uruguay's.